It’s no secret that customer experience can positively affect the bottom line. After all, offering customers a consistently great experience increases brand loyalty, which can raise revenues—in the form of higher usage, customer retention, and referrals—and also reduce costs, in the form of fewer customer service calls, attrition, and even regulatory fines. Watermark Consulting has tracked the Forrester Customer Experience Index leaders and laggards for years, looking at the cumulative eight-year stock return of the 10 best and 10 worst performers in Forrester’s annual study. The results are staggering: The top Customer Experience Leaders increased 107.5 percent in market value, compared to the S&P 500 Index’s return of 72.3 percent during the same period. But the Customer Experience Laggards returned only 27.6 percent during that time period. But the Customer Experience Laggards returned only 27.6 percent during that time period. That means the Leaders performed nearly four times better than the laggards. Another study, led by CFI Group in 2012, looked at the correlation between customer satisfaction (as determined by the annual American Customer Satisfaction Index) and found that over a 12-year period, the companies with the highest customer satisfaction scores gained 390 percent while the S&P 500 went down seven percent! 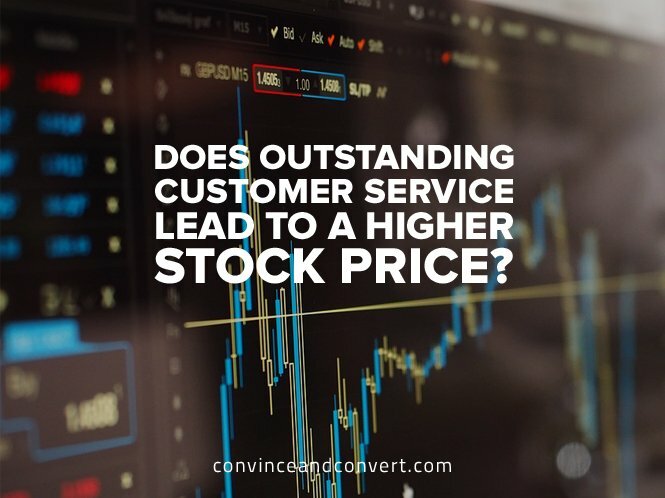 So if leading customer experience companies and leading customer satisfaction companies both outperform the stock market, does the same hold true for leading customer service companies? Customer service is only one component of customer experience, but it is a critical one. Why? Because if a customer needs your Customer Service department, it likely means that some other facet of the customer experience failed. Too many companies still look at Customer Service as a cost center, when in fact, it often represents the only “front-line” employees a customer will ever talk to. Just one failed customer service interaction can mean the difference between a loyal customer and a former customer. That means the Customer Service department can actually be a revenue generator. But does great customer service lead to higher stock returns? To be “all in” on customer service in social media, you have to have confidence in your company’s ability to acknowledge complaints, empathize with customers, and solve problems—all in the public eye. Only stellar social customer service companies are invited on the podcast so my listeners and I can learn from them, and many of them have been recommended to me by their customers. One recurring observation about these companies is that they are also really good at telephone, email, and click-to-chat customer service. In other words, serving the customer is ingrained into their culture, and extending that culture to social media is actually pretty natural. I’d argue that companies that are still holding out on social media as a viable customer service channel really haven’t prioritized customer service in other channels, either. That might actually explain their decision to stay out of social media (but not excuse it)—I always say that if you are not good at offline customer service, social media is going to be a disaster. 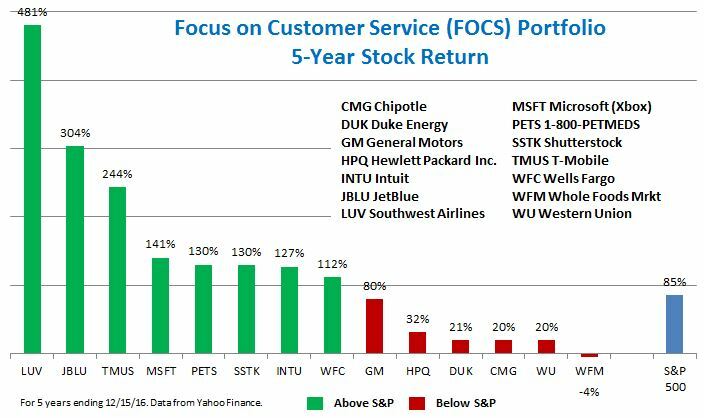 So while the FOCS portfolio is not a perfect list—or even necessarily an objective one—it’s a decent proxy for what constitutes a best-in-class customer service company. The average 5-year return of all of the companies was 131 percent, compared to the S&P 500, which returned 85 percent during the same time period. That’s a difference of 54 percent! What’s even more amazing is the average return of the 8 companies that beat the S&P in the last five years: 168 percent, or just shy of double that of the S&P! What can we learn from these results? Well, it’s important to note that this is not a stock-picking post (and, in full disclosure, I do not personally own shares in any of the above companies). But the lessons here are clear: Customer experience is important. Customer satisfaction is important. And customer service is important. All are key factors in customer loyalty, which leads to both higher revenues and lower costs—the key levers that determine profit. All of the companies above understand this—which is why they all remain so focused on the customer.